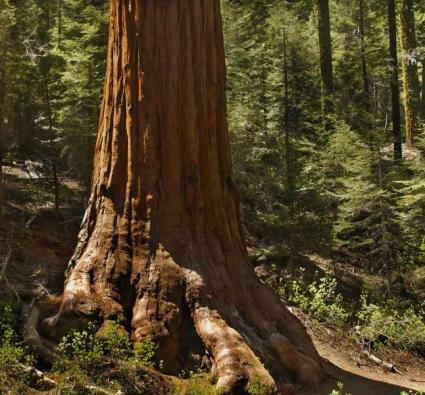 Sequoia - Enormous cone-bearing evergreen trees of the Pacific coast of N. America, just hardy enough to be the object of numerous experiments in England, far from successful either from an artistic or most other points of view. In some of the books it is said that these great trees are readily propagated by cuttings inserted under glass in autumn, but we would beg everybody never to plant any tree of the kind except from seed. Big Tree (Sequoia Gigantea) - A colossal tree in its own country, inhabiting mostly, in scattered groups or groves, the Californian Mountains for a distance of over 250 miles in length, existing trees being over 300 feet high. No tree ever introduced has excited so much interest or been the subject of so much costly experiment in this country. It succeeds well in various districts, but is badly treated as "set out" in the "specimen" way. The right way is to plant it forest fashion-say at 5 feet apart-with Larch between, to be cut out in due time, the big tree to be thinned as the years went. Syn., Wellingtonia gigantea. Red Wood (Sequoia Sempervirens) - A noble evergreen tree, thriving somewhat better in England than the Big Tree, but, planted as it usually is by itself, it is often torn about by sleet storms in our climate, which is so very different from that of its native country. Still it grows rapidly in good free soils, and is worth trying grown in a wood or grove so that the trees may shelter each other. Sheltering groves or woods of it would give good timber in quick time, as it is a very rapid grower. Coast range of W. America. Syn., Taxodium sempervirens.